The latest labour market data in the United States gives no justification for tighter policy settings, which probably is not a surprise. There is little sign of an acceleration in the economy, and there is ample slack in the labour market. 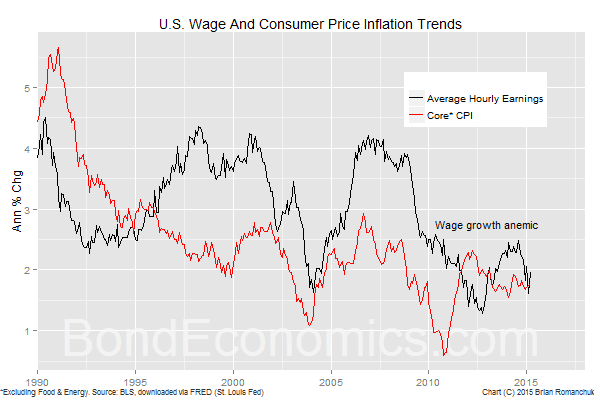 The chart above shows that annual wage and core CPI inflation are stuck at low levels, In the case of wage inflation, it is just a touch higher than it was during the low of the post-2001 recovery. 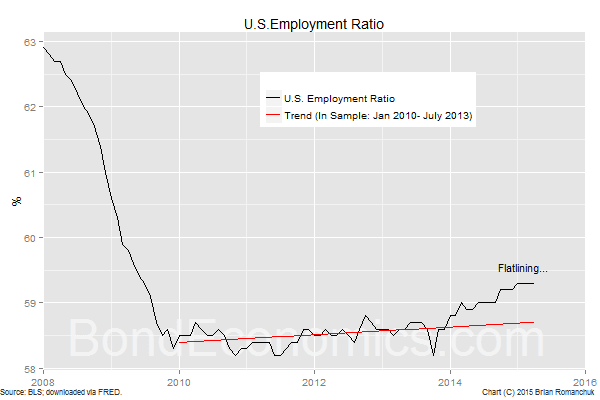 The Employment Ratio has been stuck at 59.3% since January. The glacial pace of the labour market on this measure is fairly stunning. The average of the employment ratio in 2010 was 58.6%, and so there has been a grand total of 0.7% improvement since then. I see little sign that the economy will be hitting capacity constraints this side of 2020. I realise that hawks try to excuse this poor performance because of demographics, but the static analysis typically used to justify this theory does not take into account that older people are actually clinging to their jobs later in life, given the thrashing of their net worth and pensions. 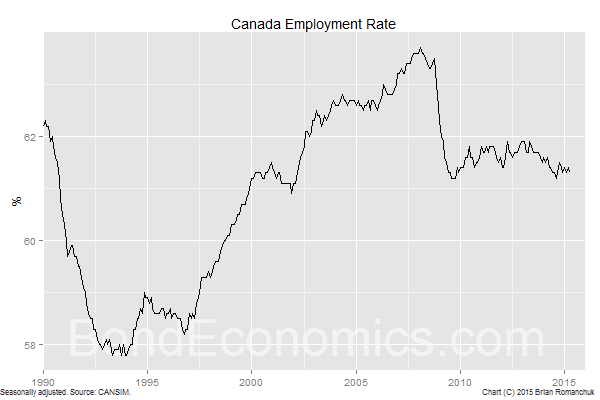 The Canadian labour market data were not a disaster, but there is signs of a slow decay. The Employment Ratio ticked down, and is only 0.1% higher than the crisis low of 2009. This is possibly better than what may have been expected, given the ongoing rout in the energy sector (as well as retail). But so long as builders keep building more condos than are actually needed, people will still have jobs. Obviously, I do not see the long-term outlook as being particularly bright.